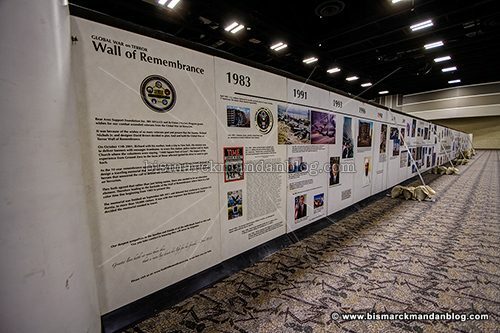 The Global War On Terror Wall of Remembrance made its way to Bismarck last weekend, and I was able to take my kids there and give it some context. One side features terrorist attacks on our country going back over thirty years as well as important points in history along the way. The other side features names of those who lost their lives due to terrorism or the war against terrorism. 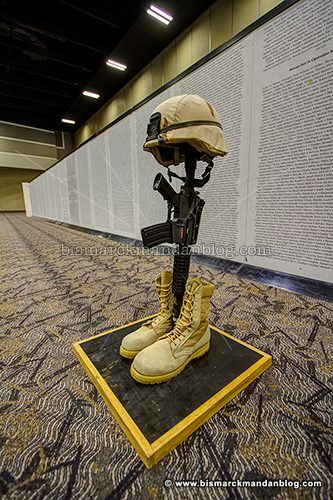 I thought ND National Guard Adjutant General Al Dohrmann put it best when he said tht every name on this wall was the most important person in the world to someone. I sat in front of this wall with my kids and did my best to impress that upon them. After a long day at the Touch the Trucks event, and hungry as heck, my kids did a great job of patiently listening to me trying to give context to this traveling monument. On the way to get our Pizza Burgers Flyin’ Style at Big Boy they asked me about how I remember the attacks of September 11th, 2001, and it was good to share my memories of the day. I hope they don’t have a similar experience in their lifetimes, although I’m not too sure what the odds are on that. Find out more about this traveling monument here. This entry was posted in Events, History, In Memoriam, Military by Clint. Bookmark the permalink.